Someone please have 911 on speed dial because this man is one slip-up away from a trip to the emergency room. Without even understanding how to work out, one could probably surmise how this machine is designed to work. Well, it looks like this assumption is wrong, and Sylvester Stallone Jr.’s first time in the gym looks like it will be an eventful, potentially painful, one. Did he approach the machine, set it to the highest weight, and invert himself like a monkey on a branch? Did he seek counsel from anyone at the gym? Had he seen this move before? We don’t know, and probably never will. Sir, you have it all wrong. Literally everything you are doing is wrong, backward, incorrect. 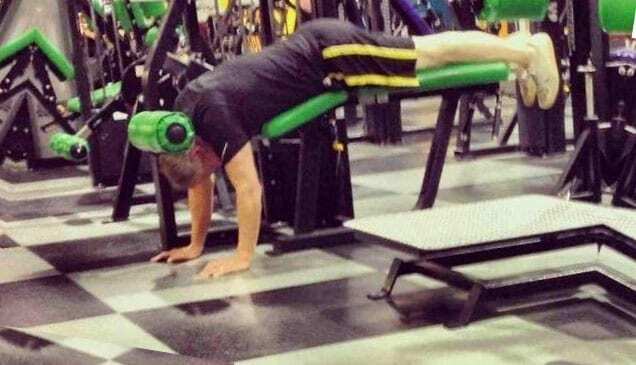 What appears to be happening here is this man is trying to get in a classic neck workout. He’s going for that middle linebacker look. He went into the gym looking like a kicker, determined to leave looking like an upgraded version of himself. Sadly, all that is bound to happen is a neck injury. That machine is designed for hamstrings and is best used for, well, hamstrings. He’s got his neck in the game, but it’s time to get his head in the game. What is going on here? Is this man so strong that he is attempting to lift every single plate in the entire world? Although the lifter looks relatively unassuming, he must have hulk-like strength and power. Or he’s not actually lifting all of those plates. But something has to give, and by the looks of it, it will be his legs. Or, this man is actually a genius and is in no way actually trying to lift those plates, but rather is just posing for a photo opportunity while secretly praying no one has over-analyzed this photo like we just did. If all goes according to plan, the man will look like a legend without ever breaking a sweat. When all else fails, and your motivation has hit an all-time low, strengthen your neck. Get those disks bulging and those veins coursing with blood. 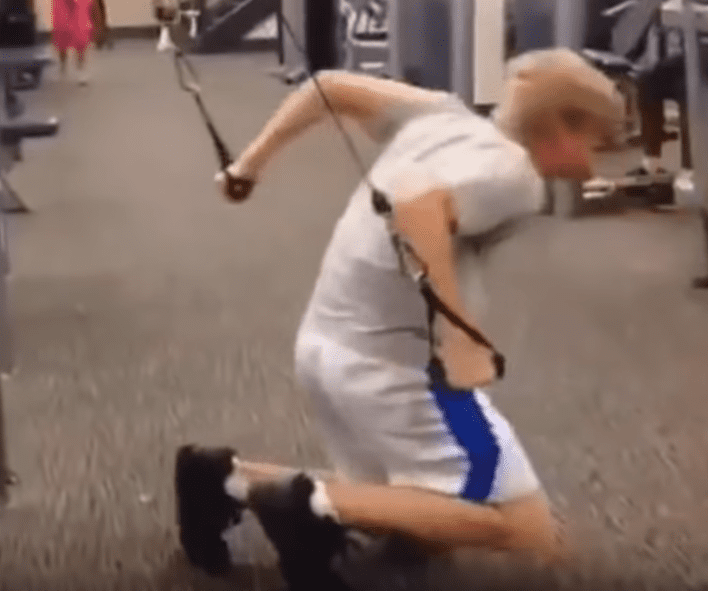 The man has no idea how to use this machine, but in the thick of it all, amidst the grunting, sweating, and slamming of weights, this man found a way to get that thick neck he always wanted. He’s an innovator, a creator, and a lifter. When all hope seems to be lost, look to this guy for inspiration. Look to this man, the one who isn’t afraid to use the machine entirely wrong and risk the potential for serious injury. Stacking Two Bosu Balls and one Swiss exercise balls on top of each doesn’t seem like a rational, sound decision. Adding in some sort of cable exercise makes whatever this gym rat is trying to achieve that much more perilous. Apparently this man is reinventing the wheel and has come up with a combo exercise that will work all the right spots. Balance? Check. Strength? No doubt. Creativity? Obviously. This move isn’t for the faint of heart and should not be tried at home (or at all for that matter). 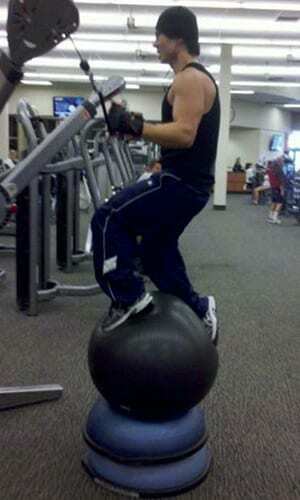 Bonus points for the workout gloves that definitely help him balance atop three rubber balls. His spotter must be a really good friend for taking this photo instead of taking the bar off his head. Here’s another example of a garage turned fitness studio, and here’s another classic example of someone lifting too much. 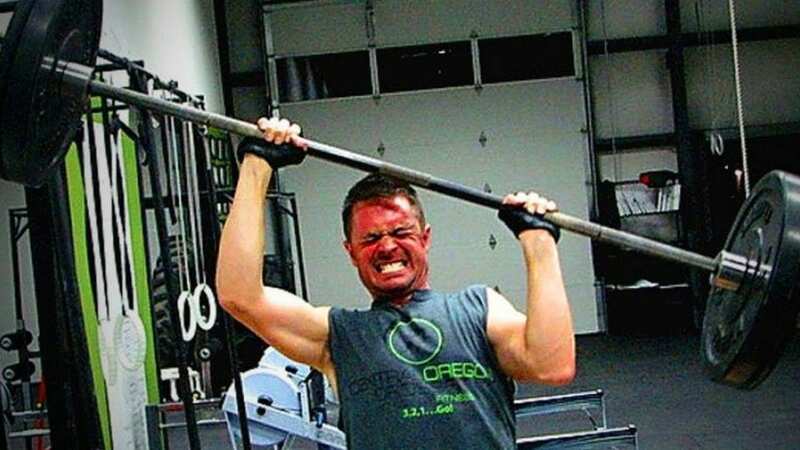 Big muscles are good, but when your face looks like a ripe cherry tomato primed to explode, the weight is probably too heavy. At that point, it’s probably best to lower the weight and stave off the imminent explosion. At least this man is prepared and has his workout gloves on, because without them, this accident could be at least 10 times worse. Most deadly piece of exercise equipment at the gym? If you answered anything other than treadmill, you’d be so wrong. 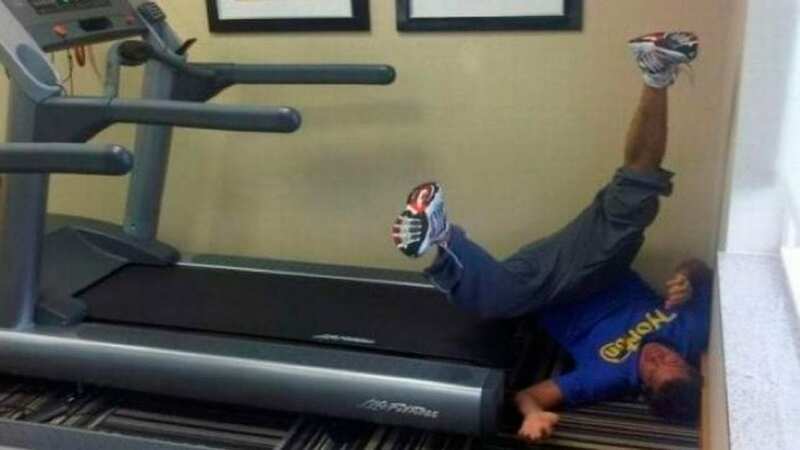 The treadmill is the classic machine that makes even the most seasoned runners look foolish. 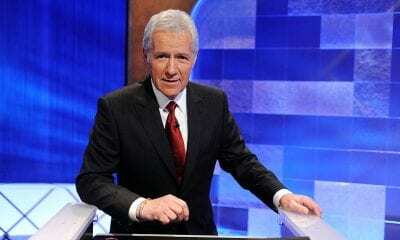 It’s the machine behind countless hilarious falls and videos, and this man is just one victim out of potentially millions. He set up the treadmill in what looks like an office covered in turf. His intentions were pure: go for a run and sweat out some calories. But the results were disastrous. In one fell swoop, the belt stripped this man of his dignity and sent him crashing back to his green earth. Rule No. 1 of spotting: be there for the lifter. Focus on the lifter. Help the lifter. That’s the job description in a nutshell. From the looks of it, this spotter/friend never got the memo and had his eyes not on the prize but on something else. 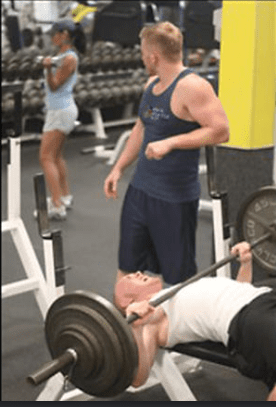 While the spotter checks out that bicep curling woman in the background, his friend is gasping for air, struggling to keep the immense weight off his chest. Did the friend not know the old adage, “Bros before …”? 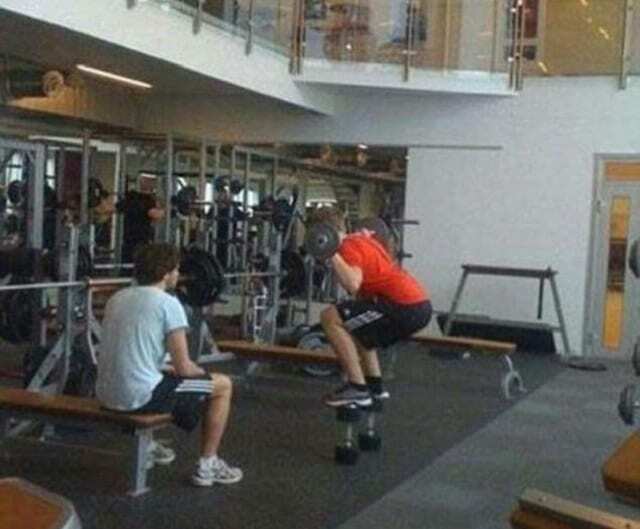 Did the friend really care more about a stranger he’d never talk to than his life-long lifting pal, his bicep bro? Yoga is generally one of the more peaceful activities on the planet. It’s where people find their zen and get their stretch on in a hot room full of Lululemon wearing participants. 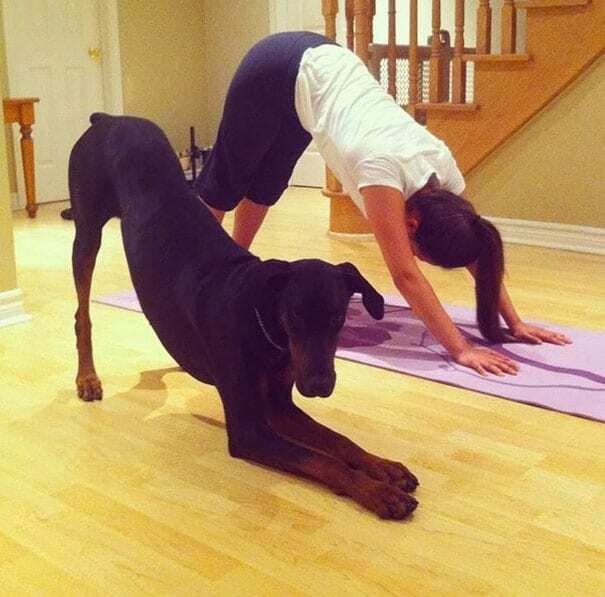 And there’s nothing like getting your stretch on next to your best friend. What’s even better than simply doing yoga next to your best friend is having your best friend be the namesake of the move your practicing, in this case downward dog. It’s like having your own private yoga instructor, except the lesson is free and the instructor doesn’t speak. Keep an eye for what move this tandem does next. Only time will tell if the dog can execute a flawless cat stretch. Well this definitely didn’t end up how this young lad anticipated it would. When the young man hopped on the trampoline, he was full of excitement and energy. He was a ball of energy ready to jump to previously unattainable heights. Sadly, this rocket crashed on re-entry. 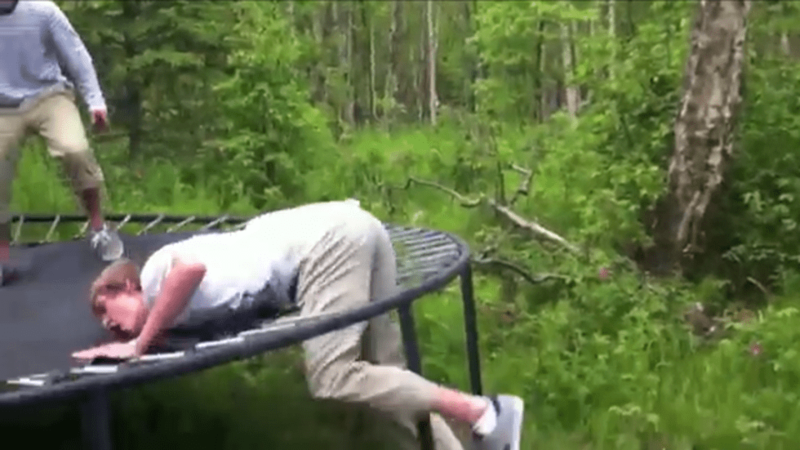 This man shot right through the boundaries of his trampoline and was sent to the earth’s core. He was also shaken to his core. Seriously trampolines are high risk, high reward (and high jumps). They can be places of serious fun and even more serious devastation. Case in point below. Just look at his face. Sir, you need to abort this mission. If you don’t you’ll face serious consequences. You will lose your street credibility forever and will never be allowed back into any gym on the planet. Before you try to exercise again, please exorcise the demons that made you workout like a madman. The machine literally has the blueprint for how to use it right on it: the seat. Chances are, if something has a seat, that means you’re supposed to sit in it. Cars, planes, trains, roller coasters, and exercise equipment all have at least one thing in common: seats. Seats made for sitting. So please, good sir, take a seat and use some common sense. One doesn’t need to be an Olympic gymnast to realize that this move wasn’t exactly executed correctly. If he was trying to land on his feet, he’s way off. If he was trying to execute a somersault, he’s slightly off. 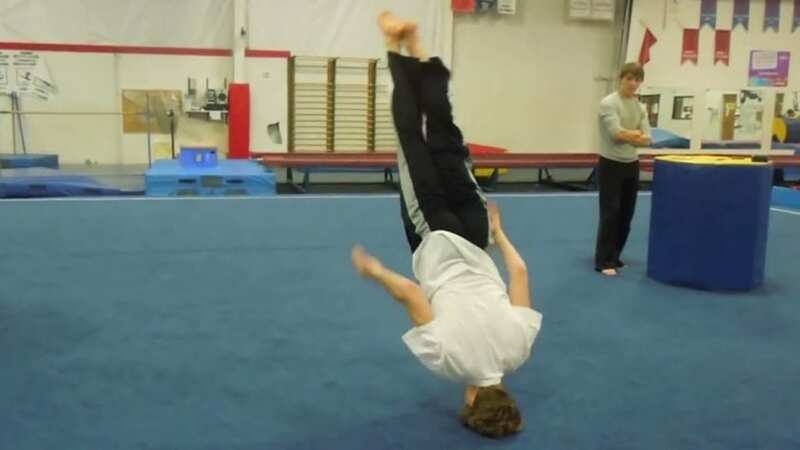 Either way, there aren’t any moves, dives, tucks, or rolls that end deliberately with a nosedive into the mat. Hopefully the young gymnast was ok and got up after what could have been a very scary accident. Side note: look at how his body is straight as a board and he holds the perfect form all the way through the moment of impact. Impressive. 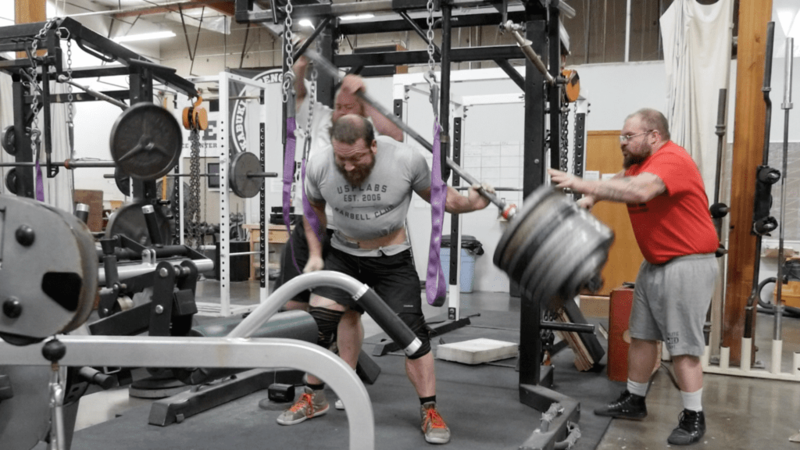 Yep, this definitely is not the position this powerlifter is supposed to be in. The lifter is supposed to be upright with the bar either overhead or rested on her shoulders. The lifter is not supposed to be folded in half with the bar aiding in the folding as it sits on her back. However, there may be a silver lining here. It appears that the powerlifter is actually quite flexible and took this spill in stride, folding more like a yoga instructor than a chair. Should competitive lifting not work out, this lifter should have numerous other career options that can take advantage of her newfound flexibility. Return of the deadly treadmill. Placing a treadmill this close to a wall is usually a bad idea because, in the off chance that you do get thrown from the machine, you’ll violently crash into the wall before getting pinned in a small space. Although the odds of this happening are low, this man was determined to defy them, and he succeeded in spades. He went from runner to run over in a split second. 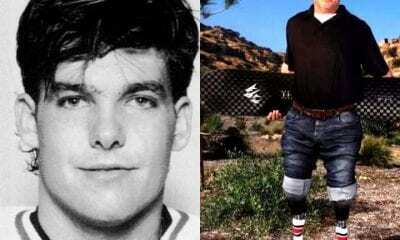 He went from vertical to inverted before he could comprehend what hit him and pull the safety clip. Here’s to hoping that the person who snapped this photo went and extracted the poor runner. The gym is a great place to…read? 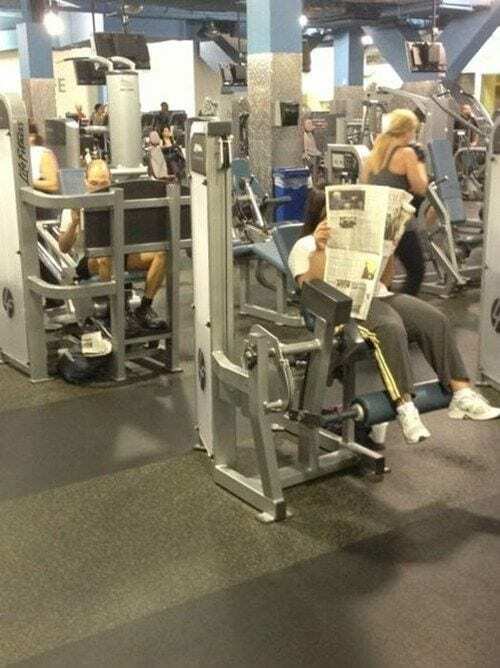 Come on, there is nothing worse than going to the gym and seeing a valuable machine being occupied by a person reading the paper (or, similarly, a person using their cell phone and not the machine). There’s a time and place for just about everything, and the gym is neither the time or the place to get caught up on the news. The gym is the place to get shredded and grunt. The library, conversely, is the place to sit down and have a nice read. Don’t combine the two. Don’t’ be this lady. Could someone please go to machine nine and save this man from the embarrassment and humiliation he’ll be subjected to for the rest of eternity? 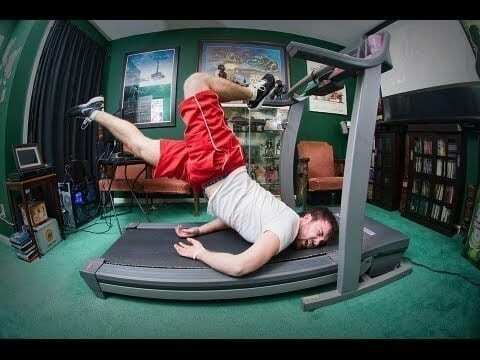 Can someone please give him a refresher course on how to use fitness equipment? Is it possible for him to do this any worse? 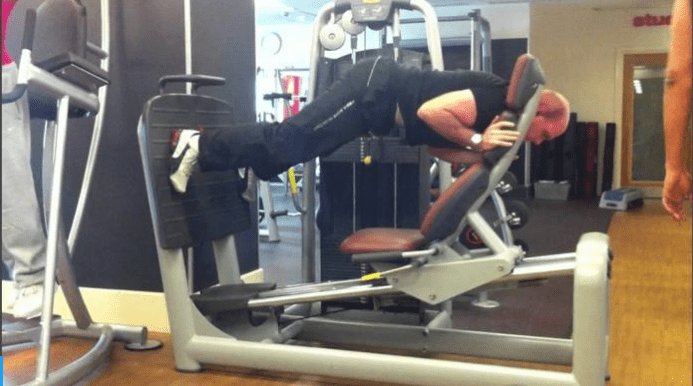 Is he using the machine to improve the strength of his hip thrusts? There are so many questions here, and, sadly, there will be little answers. We will forever be left wondering where he learned this technique, if it’s effective or not, and if he still shows his face at the obnoxiously yellow gym. 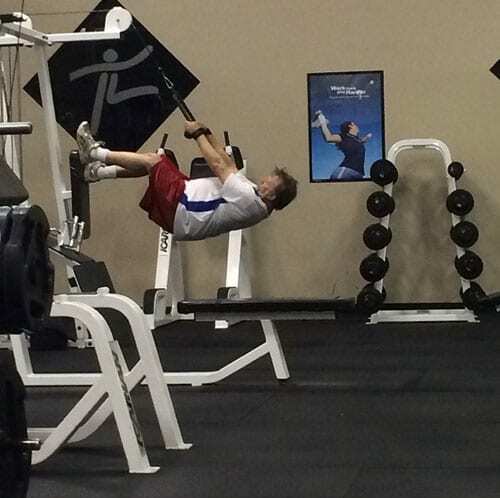 Again, another person using the gym as the place to demonstrate their impeccable balancing skills. 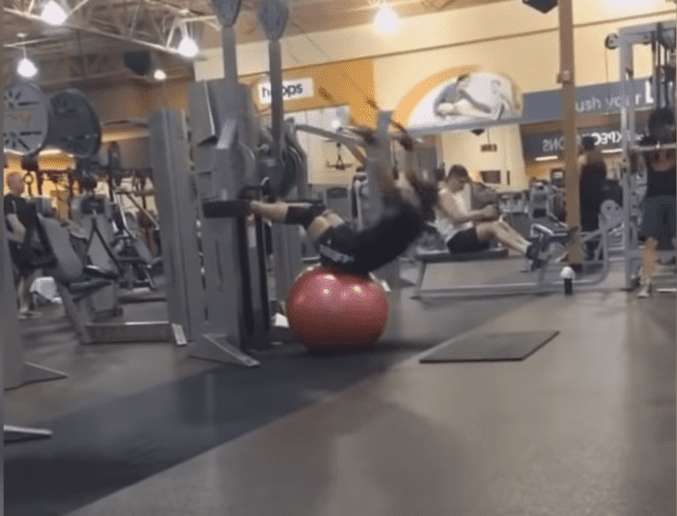 All of this looks cool until you lose balance, fall off the weights you were teetering on, and get crushed by the weight on your back. There are plenty of other ways to strengthen your legs and improve your balance, and nearly all of them don’t involve a high potential for disaster. At least the guy in red has a dedicated, albeit unenthusiastic, spotter who is actually watching him. 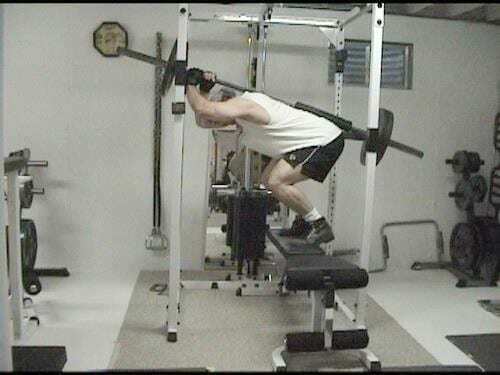 However, if the lifter can pull off this unnecessary move without losing a limb, he’ll be a certified gym legend forever. 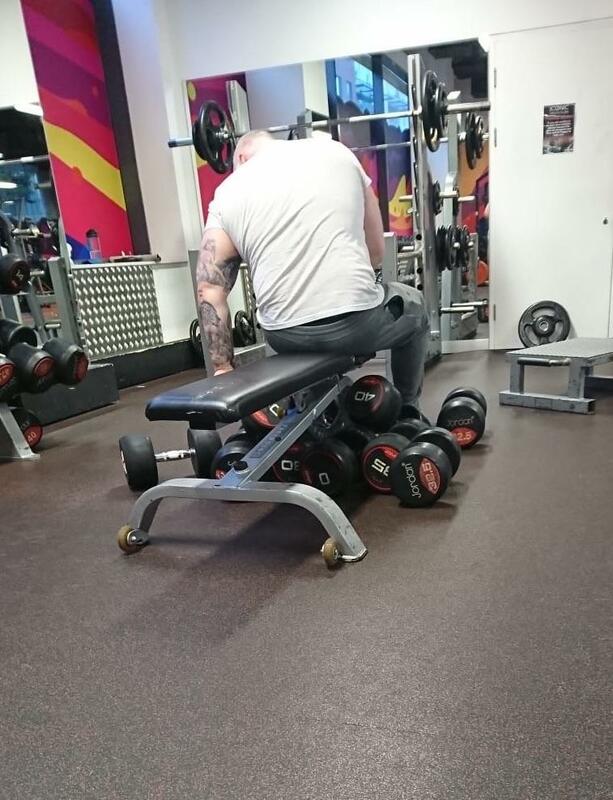 When you’re an absolute monster in the weight room, you’re bound to use all the weights available. You will pick whatever up and put it down with such palpable intensity that the entire gym can feel your presence. But what we have here is a lifter lost in thought. He’s caught between sets, pondering the meaning of fitness while he decides which weight he should use on his next set. There are plenty of choices available, but which one will lead him down the path towards terrific triceps and bursting biceps? Fun fact: when his workout ends, he’ll have a second workout just bringing all of those weights back to the rack. Ummmm…is it neck day today? Is wrapping a towel around your head necessary in order to hang 90 pounds off of one of the body’s most delicate areas? This contraption, if you will, looks shoddy at best. At worst, it looks like it could do a number on your vertebrae and spine. Once again, this guy is an at-home fitness enthusiast who has converted some room (probably garage) into a fitness palace where bulging muscles are the prophets worshipping in the temple of strength. By the look of it, the 90 pounds suspended from his halo contraption seem to be causing an unholy amount of strain and stress. Time is of the essence. There is hardly enough hours in the day to hit all the muscle groups, so this guy decided to revolutionize fitness. Two exercises at one time. While he works his quads he’s also getting his bench press on. While he gets his arms yoked, he can tell his friends that he doesn’t skip leg day. This guy is a two-for-one kind of guy. He’s a texter and a driver. He’ll cook you a meal while he binge-watches his favorite show on Netflix. The point is, this multitasking beast is reinventing fitness and proving that two is, in fact, better than one. Is this man wanting to end up in the hospital? Does he hate his life so much that he’s willing to risk it all on a stupid exercise? Whatever he’s doing is wrong. It’s a move never seen before and for good reason. It’s ineffective and dangerous. 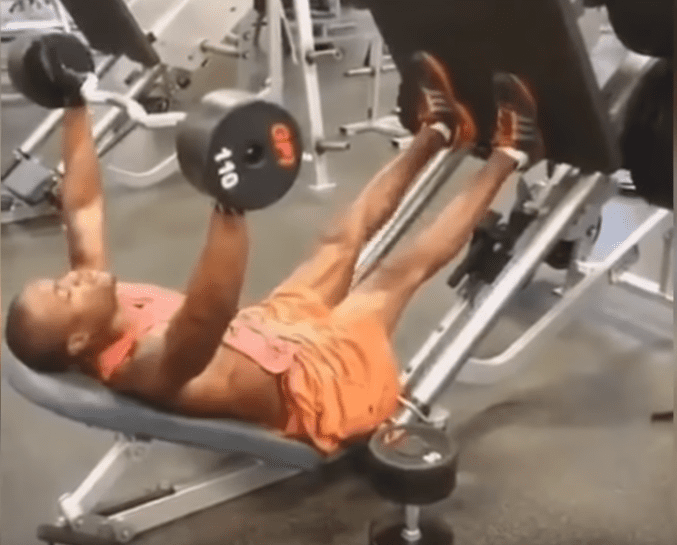 There are plenty of ways to achieve a leg/back/or arm workout, and this isn’t one of them. 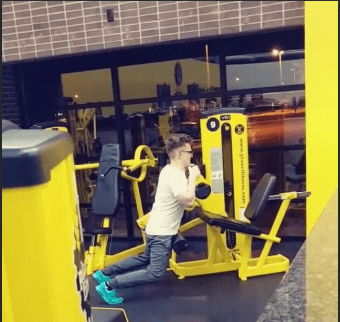 What this is is a do-it-yourself exercise concocted in the most depressed-looking gym. Hopefully, the man doesn’t learn the hard way that this move is just dumb, and hopefully he can find a pair of sneakers. 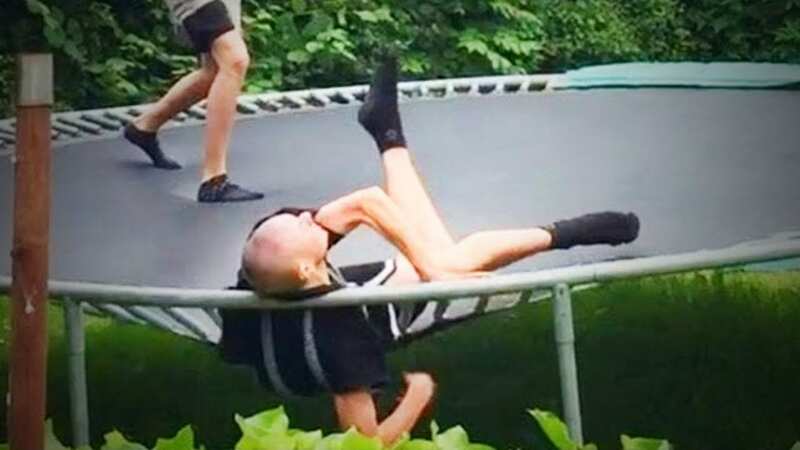 Another trampoline, another accident. These death traps seem fun on the outside, but really they are accidents waiting to happen. This guy went up with a big jump, ready to execute a double backflip McTwist 360 spin (that’s a move, right? ), but he ended up with a goose egg. His score is a pathetic zero because he didn’t stick the landing, but he certainly did get stuck. His legs are more crossed up than a defender trying to guard James Harden. Right here, right now, you are all looking at the face of defeat, the face of a fun time on the trampoline turned to agony and anguish. What on earth prompted this man to turn his entire world upside down and do everything he possibly could wrong? How did he come up with this idea, and what muscles are being worked? At least he thought ahead and placed a towel on the part where peoples’ behinds usually go. 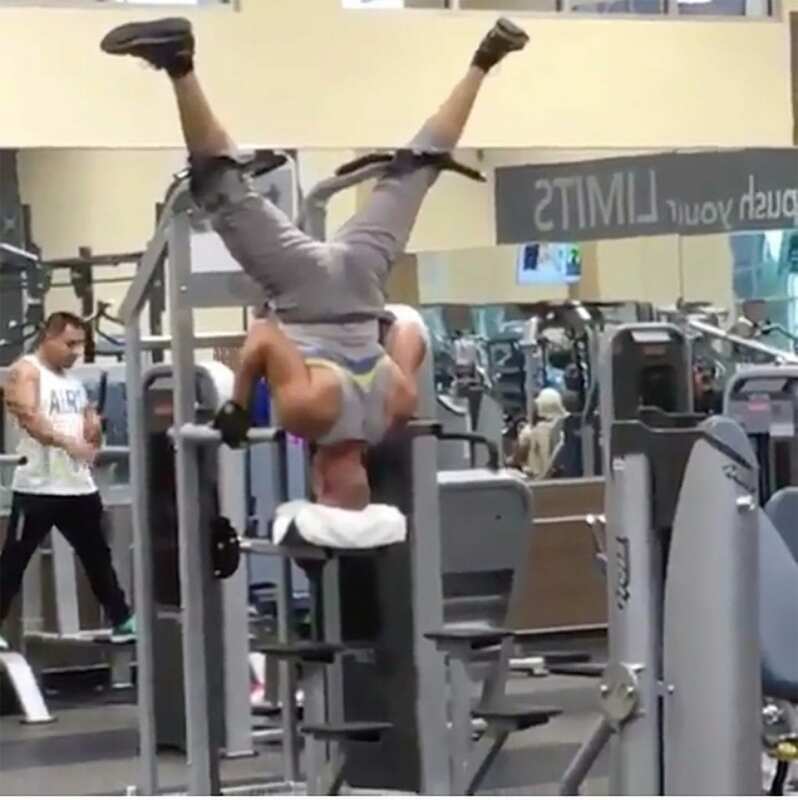 Honestly, there are seemingly no good explanations as to why this man found himself in a headstand on a machine. All that is left to do is pray, pray that his common sense returns to him and he leaves this position with urgency. The fitness community must come together during these tough times and save this man from himself, save him before permanent humiliation and injury set in. 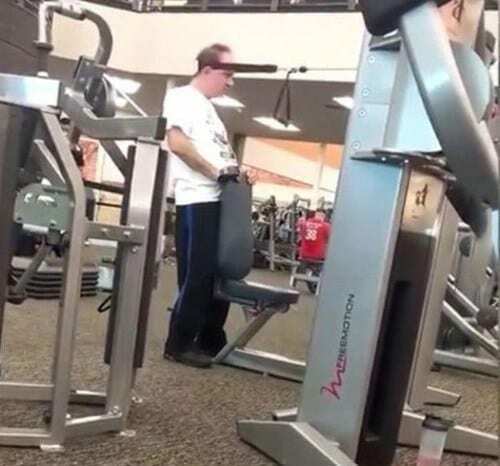 Here’s a classic example of another person having no clue how to use the equipment and working out in a potentially dangerous way. If the goal here is to do a crunch, then just lie on the ground and do them. If the goal here is to do a row, then do that on the rowing machine. Whatever muscle group this man is trying to target can be easily and more efficiently exercised by using the proper machine the right way. Lying on a swiss medicine ball and hanging on for dear life to the cables above is dangerous and inefficient. Crossfit is all the rage. Everyone is doing it and every urban area has almost as many CrossFit gyms as Starbucks Coffee shops. Crossfit has even turned the act of exercising into a televised spectacle on ESPN. Here, the competition was fierce, and this woman was just trying to get a leg up on it. 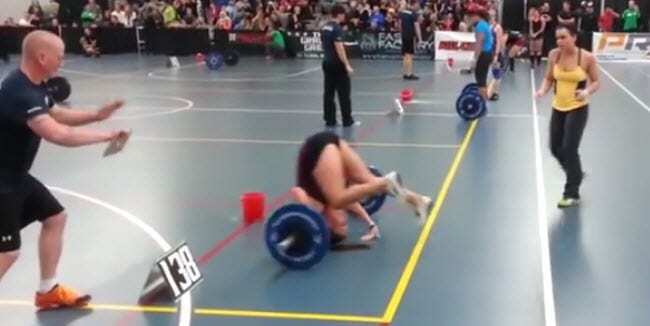 So she went for the gold and cleanly executed a CrossFit move but wasn’t able to hold it. So before she crumpled beneath the weight of the barbell and plates, she resorted to her gymnastics training and tumbled to the mat in a graceful somersault. 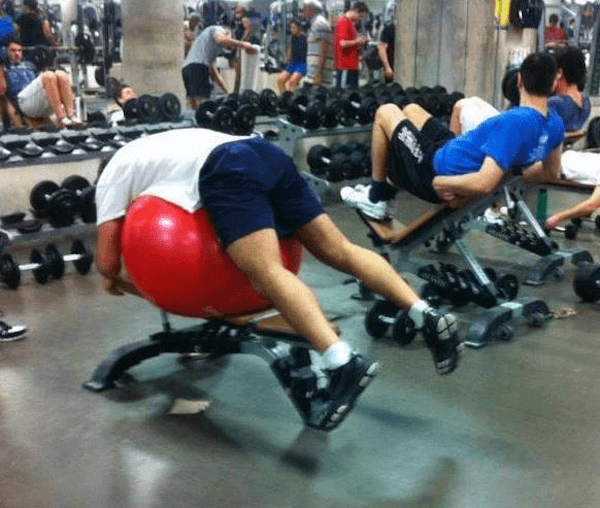 This is not how the Swiss exercise ball is supposed to be used. It’s not a bed and it’s not a means to squeeze in a quick rest, especially at a gym surrounded by people exercising. However, this man is completely oblivious to his surroundings, and when he saw the opportunity to hop on the ball and get in a few minutes of shut-eye, he pounced. He lept on the ball and stuck to it like white on rice. While the people to his left and right are getting totally shredded, this man is getting some serious REM. We respect the hustle, but please try this move elsewhere. 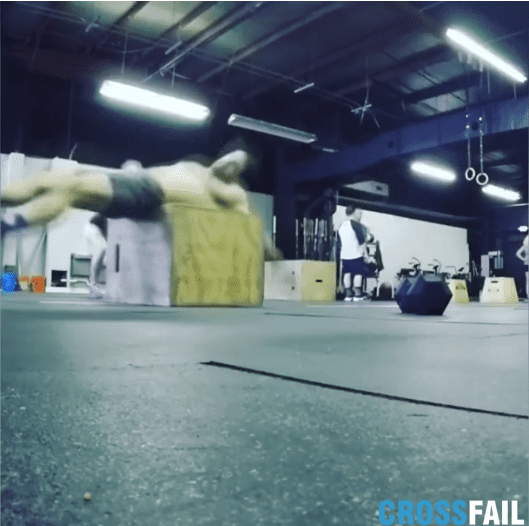 Box jumping has become quite the fitness fad over the years. For some reason, jumping on boxes has become the definitive way to measure leg power and jumping ability. More often than not, box jumping ends with the person on top of the box with their hands over their head like Rocky after running up those famous Philadelphia steps. But every so often, the box jumper isn’t so lucky. Here’s one of those instances. The jumper cleared the box but lacked the necessary stability to stay upright. In the end, the man’s back met with the box at high speed in what looked like a painful collision. Nope. Go home kid, you’re drunk. There isn’t an exercise on this planet that requires you to be in this position. There isn’t a machine, in any gym, in any country, where you are supposed to be off balance on your knees, pulling cables in different directions. While we can appreciate creativity and ingenuity, we can’t get down with stupidity and blatant disregard and disrespect for the machines. Instead of clowning around on the ground, hire a personal trainer and learn how to exercise. Your muscles and reputation will thank you. 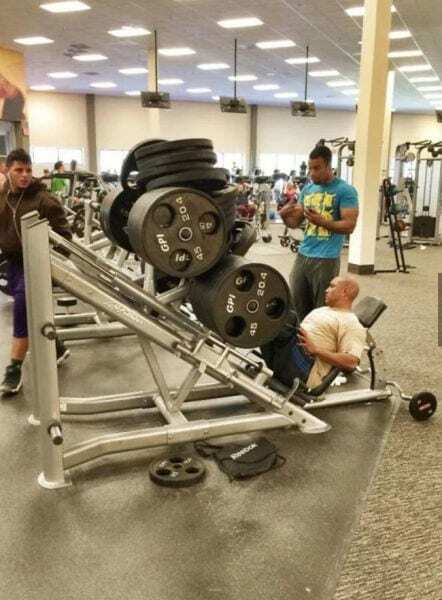 Note to readers: should you ever end up in this position, calmly remove yourself from the situation and don’t re-enter the gym for a minimum of two weeks. 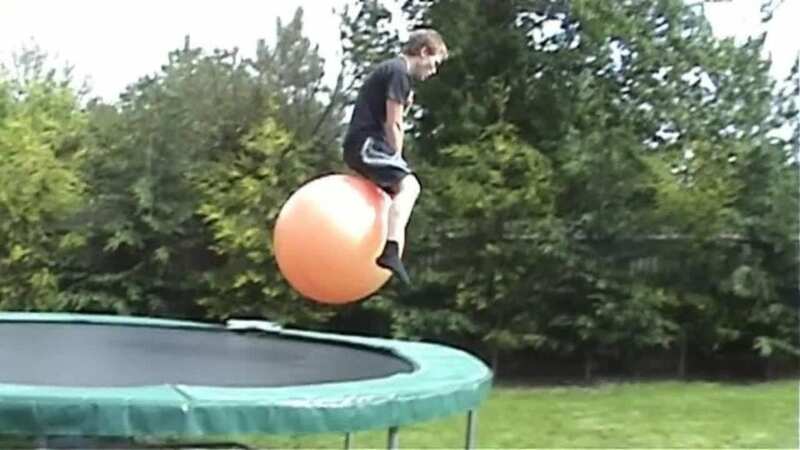 Not sure what he was thinking when he decided to launch himself off a trampoline on a rubber ball. As two separate entities, these bouncy toys can be very fun. Combine the two and you pose a serious threat to you and everyone else around you. The infamous double bounce may have been what he was trying to achieve, but in all likelihood, this stunt is only going to end with a few black and blues. The precarious position he finds himself is not to be envied. He’s trapped in limbo, no-mans land, on the edge of the hard trampoline border, the mat itself, and the earth below. Hopefully he bailed from the ball and tumbled like a professional stuntman. On the list of things this lifter didn’t want to happen this day, having the bar topple off him must have been high on the list. Besides it being relatively embarrassing, it’s dangerous, and for the spotter in red, danger is about to make its presence felt. This lifter should have been in a prime position to lift this incredibly heavy weight. He’s got two spotters guarding each side of him and a fancy lifting belt. But gravity must have been more determined than the three of them combined, because that bar and fat stack of plates is coming down, and nothing is stopping it.